From hence rather choose a life of Roads! 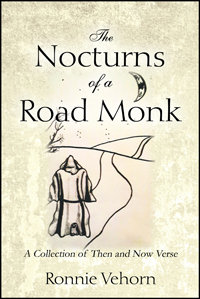 The Nocturns of a Road Monk sees Ronnie Vehorn return to the realm of poetic expression. His first book of poems, The Kafiristan Scrolls (Quill Press 1982) is reprinted here along with previously unpublished poems from that season. While visiting Tucson, AZ in November 2013 Vehorn committed himself to a book of poetry in 2014 and as a result 147 new poems have been composed for The Nocturns of a Road Monk. Ronnie Vehorn is the author of The Kafiristan Scrolls, Just Add Faith, and numerous short stories and published articles. His writing career spans five decades and several genres but in Vehorn’s words “poetry is my weapon of choice!” A South Carolinian by birth (Spartanburg 1947) but an expatriate for 26 years, the Vehorns reside on Harrison Hope Wine Estate in the Eastern Cape province of South Africa. Writing is a current focus of time and energy with old and new works in progress.